This afternoon we enjoyed an Easter egg hunt with friends. Luke was very excited about finding the eggs, and even more excited when he realized that there were treats hidden inside. He had them all opened and eaten in under five minutes. Nate's birthday dinner this evening was made completely on Sam's new charcoal grill / smoker, including the grilled pineapple dessert. (Don't worry, we let him eat more than just that one piece). 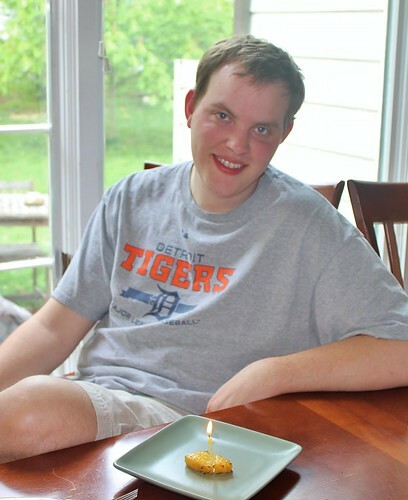 Happy birthday, Nate! We have been hearing a lot of "Luke help!" these days as Luke begins to explore all of the "fun" jobs that grown-ups get to do. 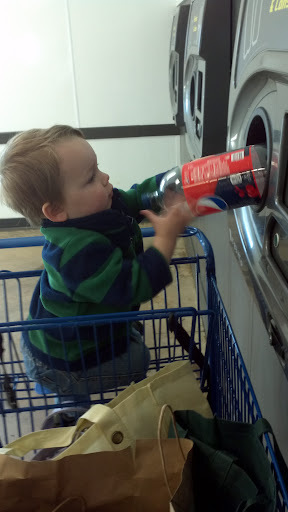 One of these exciting tasks is returning bottles and cans at Meijer. Several times I tried to get him to look at me and smile for the camera, but he was too intent on his work and refused to take his eyes off of the machine. 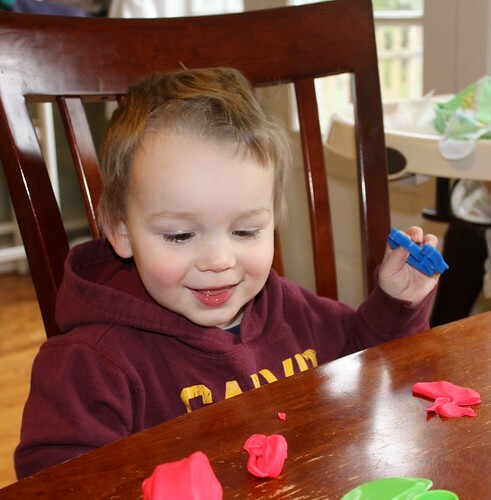 We tried play-do for the first time this morning. It was a big hit! I've seen many pictures of my nephews lining up and organizing their cars, so I guess I knew this day was coming. 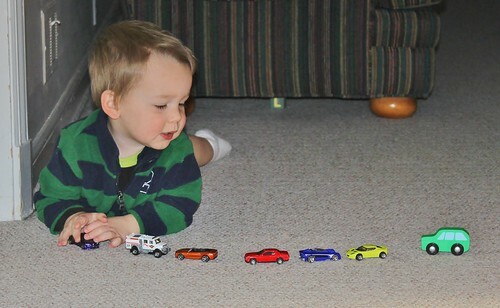 Still, it took me by surprise this morning when Luke occupied himself for a half hour just playing with these cars. Seeing him in focused, organized play like this makes me realize that we no longer have a baby in this house. Luke has been very excited all week about our upcoming visit to "papa dama house". Although he loves his grandparents, his real attraction to the place is the white stallion Misty who lives in the back pasture. Every day this week he has begged me to "see horsey, ride horsey!" I have smiled and agreed with him like a loving parent, all the while acknowledging to myself that this is definitely not going to happen. This child is so afraid of Misty that he won't even touch her. So what was he thinking when he said that he was going to ride her? This morning I got to see what he really meant by "ride horsey". A little less impressive. About 9 months ago, I wrote a blog post about our potty training journey which you can read about here if you want to. Last summer, Luke spent about 2 months wearing undies exclusively. After he seemed to make little progress in his ability to detect when he was peeing, (and when our lives got considerably busier), we decided to quit the undies a while and switch back to diapers. He's been using the potty in between diaper changes for about 6 months now. Which is great, really, but... I am still washing loads of diapers every week! Grrr. 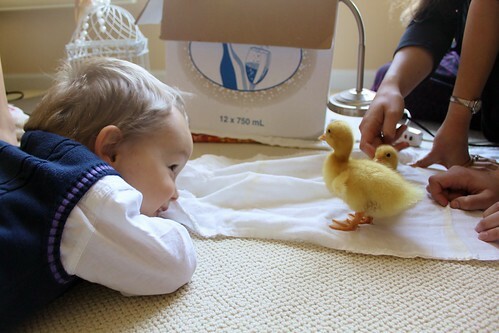 Now that he's two years old, I feel that it must be within his ability to learn to know when he has to go. 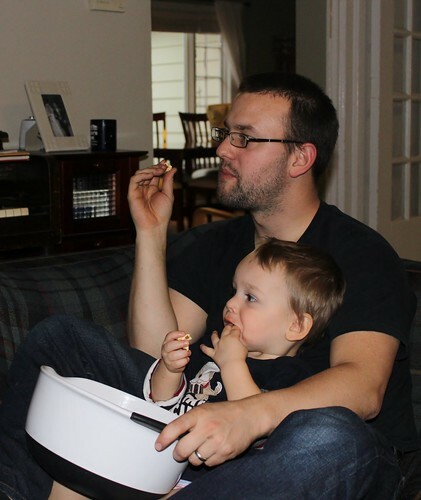 We had a quiet week this week due to Spring Break, so I decided to give potty training some serious game time. Goodbye diapers, hello undies and pull-ups. I really had no idea what to expect with this whole process, but I must say, these 2-year-old tantrums are making me wish we had stuck it out last summer! For example, every time this week that I have asked to check Luke's undies to see if they are wet or dry, he has thrown a major fit and screamed, "No wet! No dry!!" As if that makes any sense. I was at my wit's end yesterday. Thankfully like a good educated American woman I had checked out a few books on the subject to sustain me, so I scanned the pages last night looking for any ideas that might work with a 2-year-old. Certainly, I thought, with Luke being another year older, there must be more resources at my disposal. And that's when I found the idea, tucked into the pages of a chapter on training toddlers: the dolly. This is Scout. He is Luke's favorite doll. "Favorite" means he occasionally gets a hug or gets dragged into the crib at night. Luke has never initiated pretend play with a doll before, so I didn't know how he would take to potty training one. But I needn't have worried. This morning, when I told Luke that Scout had to use the potty, the biggest grin spread across that little man's face. He jumped right in, telling me what books to read to Scout, and whether or not Scout was "all done". We put undies on Scout, and when Luke sat down to eat breakfast, he insisted on sharing his toast with Scout. 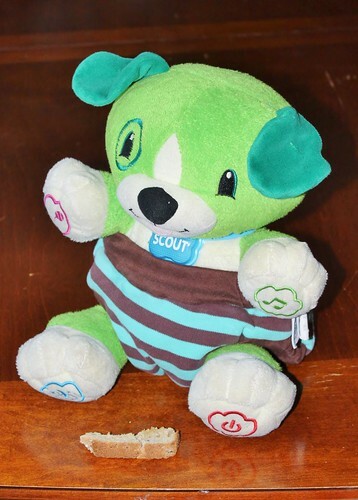 All day long, a timer goes off every 10 minutes, and every 10 minutes, we check Scout's undies and then Luke's undies. Sometimes Scout's undies are dry, sometimes they are wet. Luke still has a hard time telling the difference. But so far, he has not complained about me checking his undies. Not even once. It feels like a miracle. At 9 am, when Scout randomly informed us that he had to go potty, Luke walked him over to the potty and then stopped. He said to me, "No, LUKE potty." Then he did his business. Just like that. That's the first time he's ever told me that he has had to go!